Reading SARAH LOGAN FISHER’s diary, it is difficult to appreciate the “bright” side (for some) of the British occupation of Philadelphia. The inhabitants were short of provisions. Firewood was scarce, as was hard cash. Officers moved into houses abandoned by Whigs (without their consent), or they requested (demanded) rooms in the homes of Tory sympathizers. The poor suffered terribly as did American prisoners held by the British. Some Loyalists were disappointed by the treatment they received. And Quakers were dismayed by the revelry of the soldiers. For the upper classes, however, the winter season (1777-1778) was one of gaiety. There were assemblies, balls, dinners, plays, concerts, and parades. Quite the social whirl in fact. On Monday nights people flocked to the theater to see, in the audience, General William Howe with his supposed mistress Mrs. Elizabeth Loring, whose husband Joshua had been appointed commissary general to the prisoners in Philadelphia. The ladies welcomed news of the latest fashions and went shopping for fabrics and baubles brought from England. Hoops were in, and hairdressers were in demand. See an earlier post about the British occupation of Philadelphia HERE. For the quotation see Old Time Belles and Cavaliers by Edith Tunis Sale, p 141, accessed HERE. For a description of the Meschianza see Social Life During the British Occupation by Darlene Emmert Fisher HERE on page 251. The ticket shown is held by The Library Company of Philadelphia, a gift of Mrs. John Meredith Read, 1900. 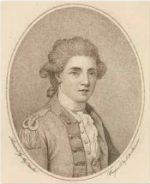 The print of Major John André is based on one of his self portraits. For additional information see the publication Quarto of the Clements Library Associates, pages 6 and 7, HERE. Also David S. Shields and Fredrika J. Teute. “The Meschianza: Sum of All Fêtes.” Journal of the Early Republic 35, no. 2 (2015): 185-214. https://muse.jhu.edu/ (accessed November 30, 2018). SARAH LOGAN FISHER continued with observations in her diary of Philadelphia during the British occupation of 1777-1778. Officers commandeered rooms in the homes of Philadelphians and stories circulated about their behavior with young ladies. Sarah had looked forward to the arrival of the British and was dis-heartened at their departure: the decision had been made, after the American victory at Saratoga and the subsequent French treaty with the Americans, to consolidate their forces in New York City. December 30, 1777— …. an officer came to desire & insist on taking up his lodgings here, which I was obliged to consent to & gave him my front parlor to lodge in & removed all my furniture upstairs, & gave some more ordinary. January 28, 1778— Lieutenant Apthorp, our lodger….appears to be an agreeable, modest young man, is about 22 & is the oldest of 14 children. March 15, 1778— …. Very bad accounts of the licentiousness of the English officers in deluding young girls. March 17, 1778— A great parade before General Howe’s door with the soldiers, it being St. Patrick’s Day, & the anniversary of my happy marriage. May 29, 1778— A fit of illness & many engagements has prevented me continuing my journal to this time…. My beloved husband returned to his welcome home the 29th of the 4th Mo. [April] with health of body & peace of mind…. And now another severe trial is likely to befall us. The English, who we had hoped & expected would have stayed & kept possession of the city, are near leaving us & it is said are going to New York, & we may expect some great suffering when the Americans again get possession. Great preparations are making for their going somewhere. All their baggage, provisions, stores of every kind are putting on board their ships, & many expect they will leave us in a very few days. Sarah reports that three peace commissioners arrived in June “with very full powers to treat with the Americans.” The mission failed and the British continued their preparations for departure. June 12, 1778— …. Took a ride in the afternoon … down the Neck. Saw great devastations indeed. Fences much destroyed, soldiers cutting the grass & bringing it away by horse loads—such is the wanton destruction that is made of our property. Apthorp, our lodger, tells me that he expects the whole army will leave the city in a few days…. June 18, 1778— This morning about 6 the grenadiers & light infantry left us & in less than a quarter of an hour the Americans were in the city. Judge, O any impartial person, what were my feelings at this time. Sarah Logan Fisher’s “Diary of Trifling Occurrences” ends with this entry. Her journal gives a great deal of information about the British occupation of Phila-delphia from the point of view of a Quaker woman with loyalist sympathies. With small children at home, and an absent husband, Sarah managed as best she could. Since she did not move in the same social circles as the elite of Philadelphia it is understandable that she has little to say about the busy social life of the upper classes who remained in the city—and would have disapproved of their frivolous pursuits in amy case. There was, of course, the usual card playing, gambling, drinking and visiting “ladies of the night” engaged in by idle soldiers. The officers of the occupying army, on the other hand, organized dinners, balls, horse races, theatrical productions, and other entertainments. All this while American forces were enduring the harsh winter at Valley Forge. In the next post a glimpse of one of the most incredible extravaganzas ever seen in Philadelphia. Mounted and overseen by Major John André, it was intended to honor General William Howe who had resigned his commission and was returning to England. Wainwright, Nicholas B., and Sarah Logan Fisher. “A Diary of Trifling Occurrences”: Philadelphia, 1776-1778.The Pennsylvania Magazine of History and Biography 82, no. 4 (1958), 460, 461, 462, 464, 465. October 9, 1777— A most agreeable piece of intelligence to all the real well-wishers of America, & as great a damp to its pretended friends, such as Washington, the Congress, Council, & all the group of what shall I call them—perhaps infernal would not be too harsh a name, for surely their characters deserve to be stamped with the blackest dye—who wish to raise their own fortunes by sacrificing thousands of lives & the total ruin of their country. November 1, 1777— …. But now after feeling & being very much discouraged at the prospect of want, & having lost our cow & no milk scarcely to be procured, not any of butter or eggs at any price, & the prospect of my children having nothing to eat but salt meat & biscuit, & but very little of that, sunk me almost below hope. December 25, 1777— Christmas Day. Sent for Sister Fisher and her little Tommy to come & dine with me on a fine turkey …. Heard an account today of our mill being burnt down. December 26, 1777— …. Felt very anxious to know how I should get a supply of hard money when what I had was gone & had some thought of selling my best Wilton carpet to raise some. Wainwright, Nicholas B., and Sarah Logan Fisher. “A Diary of Trifling Occurrences”: Philadelphia, 1776-1778.The Pennsylvania Magazine of History and Biography 82, no. 4 (1958), 451, 455, 456, 458, 459. SARAH LOGAN FISHER finally gets her wish: the British take Philadelphia. September 25, 1777— About 10 this morning the town was alarmed with an account that the English were on full march for the city & were at Germantown. People in very great confusion, some flying one way & some another as if not knowing where to go, or what to do. I was much favored not to be at all fluttered, tho’ it was an event I had so long wished to take place. We remained in expectation of them all day, but in the evening heard they were to encamp near the city & not come in till morning. The Night passed over in much quiet, tho’ many people were apprehensive of the city’s being set on fire, & near half the inhabitants, I was told, sat up to watch. September 26, 1777— Rose very early this morning in hopes of seeing a most pleasing sight. About 10 the troops began to enter. The town was still, not a cart or any obstruction in the way. The morning had before been cloudy, but nearly the time of their entrance the sun shone out with a sweet serenity, & the weather being uncommonly cool for the time of year prevented their being incommoded with the heat. 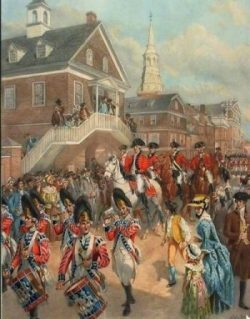 First came the light horse, led by Enoch Story & Phineas Bond [both Loyalists], as the soldiers were unacquainted with the town & different streets, nearly 200 I imagine in number, clean dress & their bright swords glittering in the sun. After that came the foot, headed by Lord Cornwallis. Before him went a band of music, which played a solemn tune, & which I afterwards understood was called “God save great George our King.” Then followed the soldiers, who looked very clean & healthy & a remarkable solidity was on their countenances, no wanton levity, or indecent mirth, but a gravity well becoming the occasion seemed on all their faces. After that came the artillery. & then the Hessian grenadiers, attended by a large band of music but not equal in fitness or solemnity to the other. Baggage wagons, Hessian women, & horses, cows, goats & asses brought up the rear. They encamped on the commons, & but for a few officers which were riding about the city. I imagine to give orders & provide quarters for their men, in 3 hours afterwards you would not have thought so great a change had taken place. Everything appeared still & quiet. A number of the inhabitants sat up to watch, & for fear of any alarm. Thus was this large city surrendered to the English without the least opposition whatever or even firing a single gun, which I thought called for great humility & deep gratitude on our parts. Wainwright, Nicholas B., and Sarah Logan Fisher. “A Diary of Trifling Occurrences”: Philadelphia, 1776-1778.The Pennsylvania Magazine of History and Biography 82, no. 4 (1958), 449-50. Illustration by Henry Alexander Ogden (1856-1936).